Last week I discovered a chrysalis clinging to the back of my outdoor rocker. It was so beautiful, bright green with gold edging around the top. This was the most recent of a number of butterfly sightings and visitations I’ve experienced in the past month or two, including a butterfly landing on my shoulder twice one day (usually a harbinger of some unexpected joy coming one’s way), and seeing a swallowtail butterfly up close, on the wall of my house. At least five or six different varieties of butterfly have been sighted, including the largest number of monarchs ever in my garden. Of course, I’ve done things to encourage them, including planting varieties of milkweed, butterfly bushes, and butterfly-friendly flowers. But the chrysalis, in the perfect place where I could watch it from my office window, was the icing on the cake! 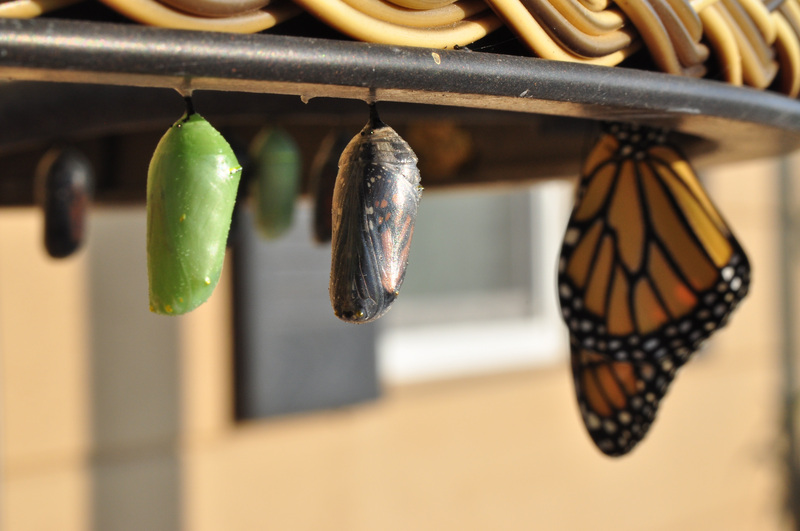 While I missed the actual moment that the butterfly emerged out of its chrysalis, it was still a wonderful reminder of joy, transformation, rebirth, and new life. In the Celtic traditions, butterflies also represent prosperity, joy, good fortune, and honor, and in many cultures, they symbolize the soul. All of these meanings are close to my heart as I prepare to offer my Mending Webs classes this fall. You may have heard of “the butterfly effect.” Based in Chaos Theory, it has been found that a butterfly flapping its wings at just the right moment can, over a period of time, cause a hurricane in another part of the world. Imagine! A barely perceptible action can dramatically affect something far away, positively or negatively. Quantum physics has also proven that no electron moves without the permission of every other electron. The conclusion? We are all part of a dynamic web. Everything in the universe is connected. Every group naturally forms a web of its own—every family, business, school, community, religious group. Often, however, the web may experience some dysfunction or disruption. In a family, for example, a divorce or death changes the way members relate to one another. Now more than ever, in our individual lives and in the world, so many of our groups (webs) cry out for mending. I developed the Mending Webs courses so that you (and/or your clients) can have healthier relationships and feel more connected and empowered. The Mending Webs courses will help you transform relationships and find joy! Yearning for a new way will not produce it. Only ending the old way can do that. You cannot hold onto the old all the while declaring that you want something new. The old will defy the new; the old will deny the new; the old will decry the new. There is only one way to bring in the new. You must make room for it. As you mend your webs, you make room for healthier, more fulfilling relationships. Please watch for the invitation to Mending Webs coming out soon. I hope you will join me in November. When we do this kind of work, it truly impacts the world! May you also seek and find ways to experience transformation and joy, so you too may contribute to a positive, glorious butterfly effect. PS: If you are finding this time intense and would like support, please check out my individual sessions page here. Or learn about my Spiritual Transformation Group that is starting again in September. If you aren’t sure which way to go, please book a call with me here, and we can discern together.